Seasonal scents are some of my favorite indulgences this time of year. I love burning candles but also incorporate my favorite scents into my skincare products. Live Beautifully has some of the most decadent options to choose from, each created with natural, clean formulas you can feel good about. Fall Scents | The Fall Dessert Lip Balm Set is one of the ways Live Beautifully captures the essence of fall. 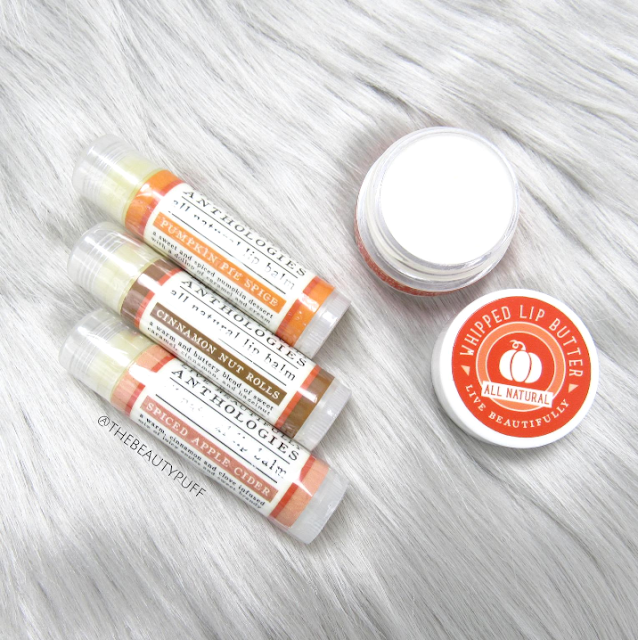 This set includes three lip balms inspired by traditional fall treats - Spiced Apple Cider, Cinnamon Nut Rolls and Pumpkin Pie Spice. I can't help smelling them every time I apply - so good! Not only that, they're super smooth, nourishing and perfect to protect your lips against the cold dry air. Key ingredients in these lip balms include Bees Wax, Cocoa Butter, Shea Butter, Mango Butter, Apricot Kernel Oil, Grapeseed Oil, Sweet Almond Oil, Macadamia Nut Oil, and Coconut Oil. The Live Beautifully Lip Butters are another enticing way to pamper your lips this season. Pumpkin & Vanilla is one of a multitude of vanilla based scents that will have you reapplying just because it's fun! The formula is rich, silky and luxurious on the lips and gives a simple sheen. It has a lot of slip to it so its perfect to wear all on its own or overnight for deep nourishment. Key ingredients include Shea Butter, Cocoa Butter, Grapeseed Oil, and Vitamin E.
Winter Scents | If you're like me, you live for all the scents that bring to mind Christmastime. Those scents that make you want to bake, listen to seasonal music, and indulge in all your favorite desserts. Frosted Peppermint is a smooth, sweet and fresh scent that's perfect for anyone on your list. I have it in the lip balm and Solid Lotion Bar Tube. Both these items are perfect for travel and especially stocking stuffers. I love the convenience of a solid lotion too. No messy squeeze tubes or worrying about anything leaking in your luggage. Just throw it in your bag and you're good to go. I'll definitely be keeping this one in my purse, it's so cute! 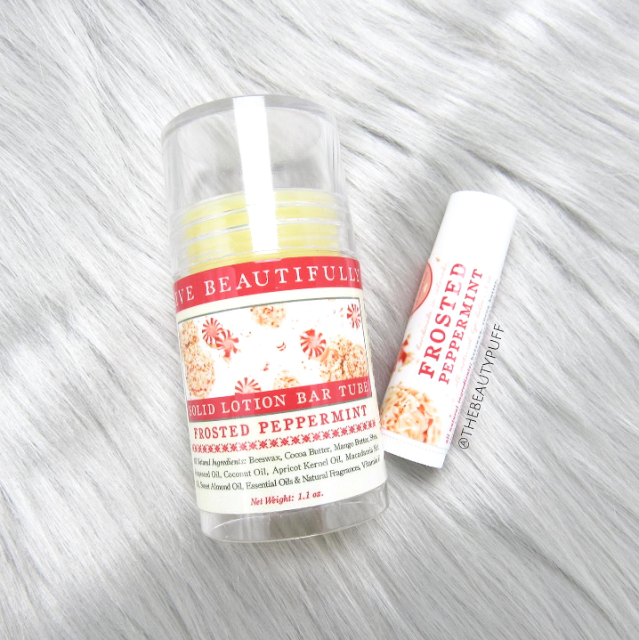 If you want to enjoy all your favorite seasonal scents with natural, healthy products, check out Live Beautifully and their extensive skincare line. They even have solid perfumes, lip glosses, and deodorants. I personally love the Blueberry Violet scent, it's amazing!